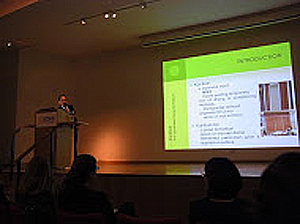 From April 8 to 10, 2015, a conference entitled “Adapt & Evolve: East Asian Materials and Techniques in Western Conservation” took place mainly at the Brunei Gallery at the University of London. The conference was organized by the Book and Paper Group of the Institute of Conservation (colloquially known as ICON) in the UK. The conference consisted of tours of relevant institutions in the City of London, group events (presentations and question-and-answer panels), and various workshops. MASUDA Katsuhiko (an emeritus researcher at the Institute, currently a professor at Showa Women’s University), HAYAKAWA Noriko (a senior researcher at the Institute), and KATO Masato (a head of the Resource and Systems Research Section at the Institute) reported on the results of projects such as international training in Conservation of Japanese Paper (JPC) and the Cooperative Program for the Conservation of Japanese Art Objects Overseas as well as studies of the materials used to restore cultural properties. In addition, post-conference workshops were conducted after the conference. HAYAKAWA Noriko and KUSONOKI Kyoko (an associate fellow of the Institute) explained the traditional adhesives used in the field of conservation in Japan, and showed how to make starch paste and they instructed attendees in its application. According to the conference organizer, the conference was attended by about 300 people from around the world. During the question-and-answer session, the conference chair asked the audience about the JPC, and the answer revealed that 30 or more individuals who had completed the training were in attendance. Individuals who had completed other workshops organized by the Institute were also in attendance. Thus, the Institute plays a major role in introducing East Asian materials and techniques to Western conservation. 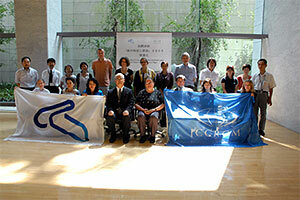 In addition, many of the attendees asked that the Institute continue to provide information about conservation. This workshop is held annually as a part of the Cooperative Program for the Conservation of Japanese Art Objects Overseas. 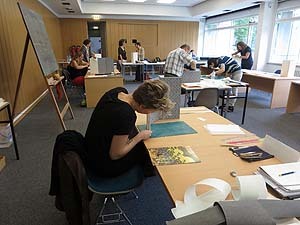 This year, it was held at the Asian Art Museum, National Museums in Berlin, with the basic course, “Japanese paper and silk cultural properties,” from July 3rd through the 5th, and with the applied course, “Restoration of Japanese folding screens,” from July 8th through the 12th. The basic course covered the process from production of a cultural property to its appearance before the public, i.e. 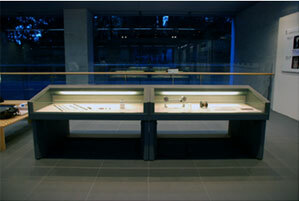 its creation, mounting, exhibition, and viewing. Lectures, demonstrations, and training were conducted regarding materials such as paper, pigments, paste, and animal glue, techniques of creating Japanese paintings and calligraphy, aspects of mounting, and handling of cultural properties. The applied course included a workshop primarily on practice restoring a folding screen using traditional conservation techniques. Attendees actually produced wooden lattice undercores, which are then covered with multiple layers of paper to create a folding screen, and paper hinges that join panels of the folding screen. 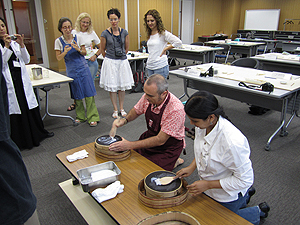 This workshop seeks to offer the opportunity to understand Japanese tangible cultural properties such as paintings and calligraphic works to thus broaden understanding of intangible cultural properties as well, such as papermaking and mounting, among as many foreign conservators as possible. 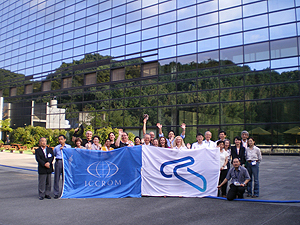 Every year, the Institute conducts international training with ICCROM. In a typical year, there are around 70–80 applications. This year, that number was winnowed down to 10 trainees from the US, Italy, Egypt, Australia, Austria, Thailand, Colombia, Denmark, Poland, and Russia. The course lasted 3 weeks starting on Aug. 27th. The course focused particularly on Japanese paper and included classes from various perspectives such as materials science and history. During training, trainees mounted a paper-sheet cultural properties as handscrolls be steps such as infilling and lining, and they also prepared booklets with Japanese-style binding. Participants visited the Mino region in Gifu Prefecture, where a type of Japanese handmade paper that is used in restoration work is produced, and they also learned about the distribution of Japanese paper throughout history, from its manufacture to its transportation and sale. Participants also viewed the latest exhibits of cultural properties and conservation facilities at the Kyushu National Museum. 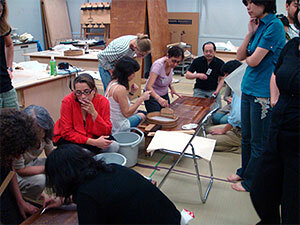 Trainees visited a traditional mounting studio and stores selling traditional tools and materials in Kyoto, and they learned about circumstances involving the conservation and restoration of paper in Japan. 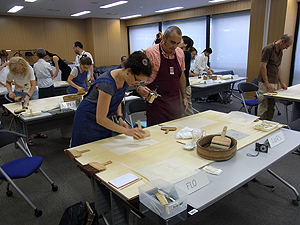 The techniques and knowledge provided by this training will help encourage the conservation and exhibition of paper cultural properties from Japan in collections overseas and can also be used to conserve works abroad. 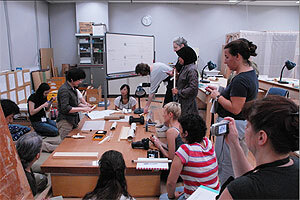 This workshop is held annually as a part of the Cooperative Program for the Conservation of Japanese Art Objects Overseas. 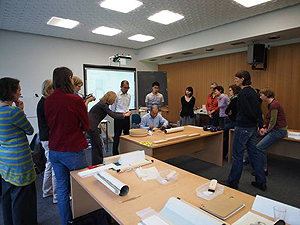 This year, it was held at the Asian Art Museum, National Museums in Berｌin, with the basic course, “Japanese paper and silk cultural properties,” from July 11th through 13th, and again with the applied course, “Restoration of Japanese hanging scrolls,” from the 16th through the 20th. 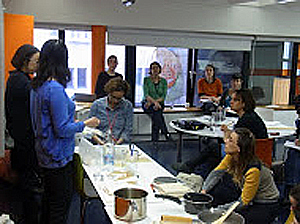 In the basic course, following the practical process of cultural properties from creation, through mounting, exhibition and up to appreciation, we gave lectures, demonstrations and training for materials such as paper, pigmnets, paste,and animal glue, techniques of creating paintings,and caligraphy, mounting culture and handling of those cultural properties. 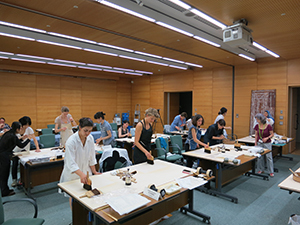 In the applied course, we gave a workshop centered on practices in relation to restoring hanging scrolls using restoration techinques based on traditional Japanese mounting. We focused on the diagnosis of hanging scrolls, structure consiting of multiple paper layers of hanging scrolls, the emergency treatment and usage of traditional brushes and edged tools. 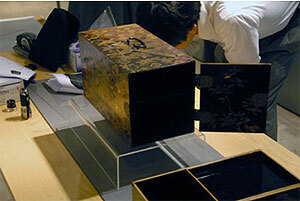 Recently, the restoration techniques based on traditional Japanese mounting have been renowned abroad, and have come to be put to use in foreign paper cultural properties. However, for many foreign conservation specialists, the techniques are learned through reference books and hearsay. Through this workshop, we would like to offer an opportunity to understand the authentic materials and techniques to as many foreign conservation specialists as possible. 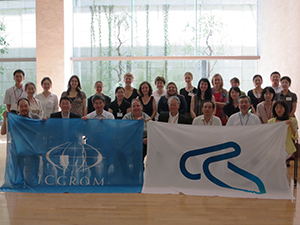 International training course was conducted from August 29th to September 16th by ICCROM, the Kyushu National Museum, and the Institute. Applications were received from close to 60 individuals who work with cultural properties from around the world, and this number was winnowed down to 10 trainees from as far away as India, Switzerland, and Mexico. The course focused particularly on Japanese paper and included classes from perspectives ranging from materials science to history. At the same time, trainees participated in practicum where they replaced missing areas, attached linings, and attached roller rods to produce finished handscrolls; trainees also prepared booklets with Japanese-style binding. Participants visited the Mino region in Gifu Prefecture, where a type of Japanese handmade paper that is used in restoration work is produced, and they also visited a town where traditional buildings are being conserved. Trainees learned about the distribution of Japanese paper throughout history, from its manufacture to its transportation and sale. In addition, trainees visited a traditional mounting studio and stores selling traditional tools and materials and learned about circumstances involving the traditional conservation and restoration of paper in Japan. 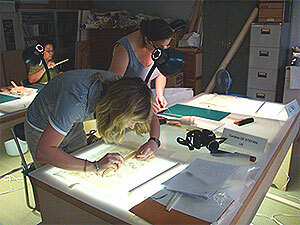 The techniques and knowledge provided by this course will help encourage the conservation, restoration, and exhibition of Japanese paper cultural properties in collections overseas and can also be used to conserve and restore works made outside Japan. We held the 33rd International symposium on the conservation and restoration of cultural property “Restoration of Japanese Paintings – Advanced Technology and Traditional Techniques” at the Heiseikan of Tokyo National Museum for the three days from November 12 to 14. 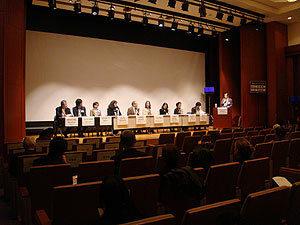 Four lectures were given from foreign countries and eleven from Japan on the restoration of Japanese paintings in order to recognize anew the materials and techniques by confirming the current status inside and outside Japan scientifically and objectively, as well as to promote the conservation and utilization of Japanese paintings owned widely in the world by sharing the knowledge acquired here. Over 350 people – restorators, conservation scientists, curators and manufacturers of traditional materials – participated in the symposium. A report on the details of lectures and discussions will be issued next year. 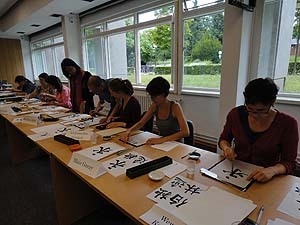 Ten persons were selected from a total of 80 applicants who are engaged in the conservation and utilization of cultural properties throughout the world to participate in the International Course on Conservation of Japanese Paper from September 8 to 26, 2008 that was held jointly with ICCROM(International Centre for the Study of the Preservation and Restoration of Cultural Properties). The course consisted of lectures, practical sessions and a study tour. 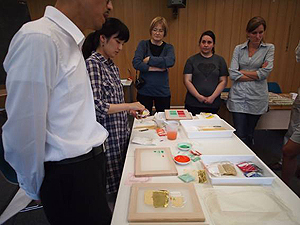 Topics covered in the lectures included material studies on paper and traditional Japanese adhesives, principles regard-paring the conservation of cultural properties, Japanese-style painting techniques, mounting techniques and mounting formats. In the practical sessions the participants cleaned paper made for practice, infilled holes that had been made to look as if they had been damaged by insects, and mounted the work they had restored into a hanging scroll. They also challenged Japanesestyle book binding. In the study tour, the participants first visited Mino city in Gifu prefecture and learned about minogami (Mino paper), from the traditional method for manufacturing it to the history of its distribution, at Hasegawa Washi Kobo, Mino-Washi Museum and Mino Historical Museum. They also visited the conservation studios of the Association for Conservation of National Treasures both at the Kyoto National Museum and their independent studios. An exhibition concerning the detachment and restoration of the wall paintings of the Kitora Tumulus, a Special Historic Site, is being held in the lobby of the Institute. There are panels with photographs and illustrations that provide information about the Kitora Tumulus itself and the conservation project. In particular, explanation is given, in order, of the entire process of the conservation of the wall paintings, from their detachment from the site to treatments given in preparation for a special exhibit. In addition, samples of plaster made in order to select tools for use in detaching the wall paintings and the tools themselves are exhibited. With regard to the conservation of the mural paintings of the Takamatsuzuka Tumulus, it was decided in 2005, from the point of view of prevention of damage due to microorganisms, to temporarily dismantle the stone chamber and to remove the paintings for restoration. Discussions were held concerning various issues such as the method for dismantling the stone chamber and transporting the stones, method for treating the mural paintings and the stones, and the construction of a restoration facility. From April 2007, the work of dismantling the stone chamber, transporting the stones to the restoration facility and the restoration of the paintings started. The National Research Institute for Cultural Properties, Tokyo is involved in this project for the conservation of the mural paintings especially from the aspects of environmental control, biological measures and restoration of the paintings. In this month’s report, measures taken with regard to the paintings will be introduced. Various influences that may occur to the paintings when transporting the stones from the tumulus to the restoration facility were discussed in detail. The surface of the paintings is first reinforced by using cellulose derivatives and/or protected by using a special type of paper. Once transported to the Temporary Restoration Facility built for the purpose, the stones are cleaned in the preparation room to remove dirt and grime from the surface. Although the environment inside the facility is in a condition not favorable for fungal growth, sterilization with ethanol is also done. 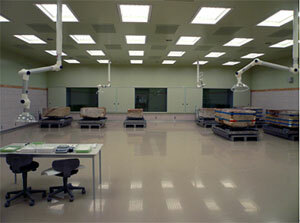 Once cleaning is completed, the stones are taken to their respective positions within the restoration room. Main work of the restoration of the paintings begins after the stones have been moved into the restoration room. Presently, paper applied for protection is carefully being removed. The painting surface is being carefully observed and ways of cleaning the painting surface and methods of restoration are being discussed. As of May 31, 7 stones have been moved into the Temporary Restoration Facility and are waiting full-scale restoration.